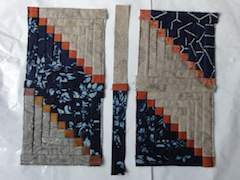 Although most people assume that reversible quilts comprise two surfaces constructed separately and joined together afterwoards, this isn't the case. Although the number of blocks depends on the quilt size, they are constructed individually and only joined together when all are completed. Before constructing the first block one prepares all the fabrics which will be used. Log Cabin blocks are constructed by starting in the center and building outwards to the edges. As one starts, one must also prepare one piece of batting which is the same size as the two center pieces. 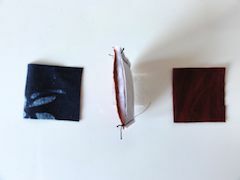 For both A and B sides the surface side of the fabrics must face outwards, with the batting in between creating a "sandwich". From there one attaches fabric and batting alternately. When attaching fabrics to the initial "sandwich" the surface sides must now face inwards. 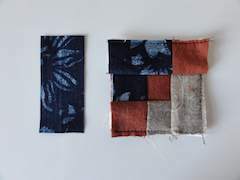 Sewing both new pieces to the "sandwiching" one then folds the new pieces outwards, and it is usually best to use an iron to create smooth surfaces on both sides. Then one inserts a piece of batting (without seam allowance). Keep repeating this alternating process until the block has reached the desired size. In this manner one creates as many blocks as needed. When joining them together one additional strip is placed between each pair of blocks.